I enjoy those days when he cooks for us. Some times he makes 'butterfly chicken' (grilled full chicken with his secret masalas) and 'hummus', we have this dish with 'tandoori roti ' or ' khubs ' Its a heavy meal, we eat this for lunch. 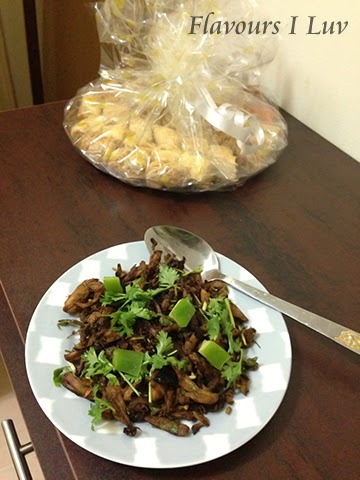 Off to today's recipe, a non gravy side-dish which he often makes, that goes well with fried rice, bhatura etc,. Its even used as a filling for sandwich or spring rolls. Its a kids friendly recipe too. You can make a chapati roll with this for your kid 's lunch box. Cook chicken breast with 1 tsp chilly powder and 2 tbsp soy sauce. Shred chicken into small pieces. In a pan add oil and fry onion slices till brown, add green chillies followed by shredded chicken. Saute chicken till it becomes dry, add remaining sauce and saute again. When chicken is dried completely, remove from fire. 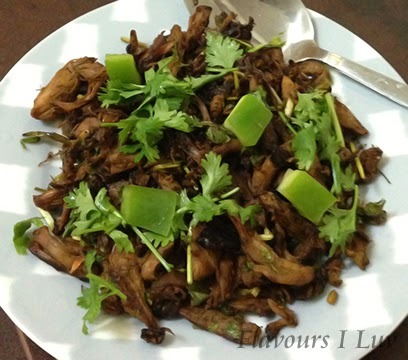 Garnish with capsicum and coriander leaves. looks delicious, and Eid mubarak to you too. A simple dish yet packed with the flavors I will jump high up for. Definitely keeping the recipe aside for my own venture at home. That looks delicious!! I bet it will be perfect when paired with rostis or naan.